Director/Screenplay – James Cameron, Producer – Gale Ann Hurd, Photography – Mikael Salomon, Underwater Photography – Al Giddings, Music – Alan Silvestri, Visual Effects Supervisors – John Bruno, Laura Buff, Dennis Muren, Robert Skotak, Gene Warren Jr & Hoyt Yeatman, Makeup Effects – EFX Inc (Supervisor – Steve Johnson), Production Design – Leslie Dilley. Production Company – GJP Productions/20th Century Fox. When one of their nuclear submarines goes down near the Cayman Trench, the US Navy commandeers the crew of a deep-sea mining rig to conduct a rescue operation under the command of a Navy SEAL unit. The rig crew then encounter an alien lifeform sequestered on the ocean floor. Coffey, the commander of the Navy SEAL unit, is going mad from pressure psychosis. Believing the aliens to be Russians, he launches a nuclear warhead down into the Trench. The rig’s commander Bud Brigman must make a descent into the two-mile deep trench, deeper than any human has been before, to disarm the warhead before it explodes. James Cameron is the director that could be single-handedly held responsible for the current action and CGI effects blockbuster and the mania for runaway nine figure budgets. Following The Abyss, James Cameron’s three next films – Terminator 2: Judgement Day (1991), True Lies (1994) and Titanic (1997) – were all the most expensive films ever made at the time of their release. 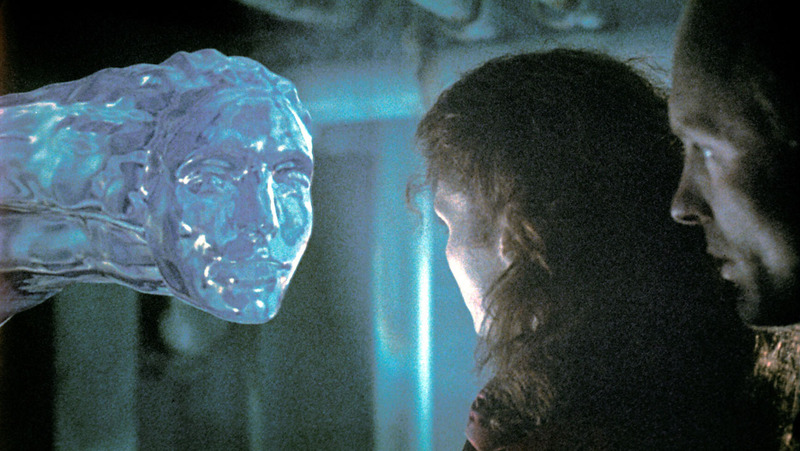 The Abyss was the film that first gave rise to Cameron’s reputation as an exacting technologist and an autocratic taskmaster. 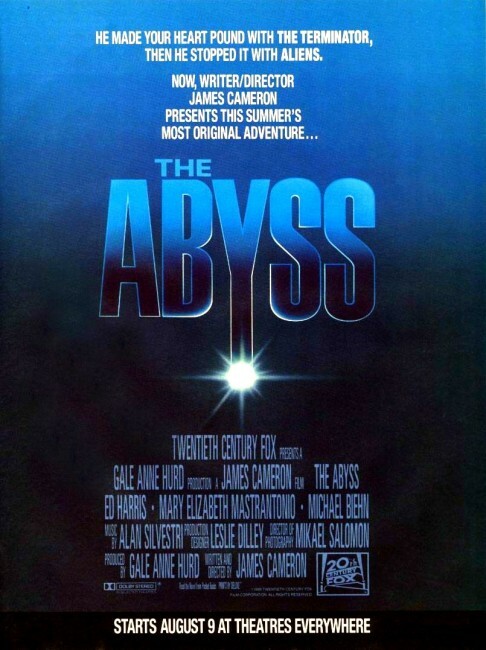 The Abyss, with a then hefty $60 million pricetag, was shot in a giant abandoned nuclear containment facility that was flooded with water especially for filming. Cameron demanded so much of his cast that star Ed Harris refused to participate in promoting the film and reputedly will not talk to Cameron to this day. The difference between James Cameron and any other action movie director – especially when compared to the soulless bludgeoning of contemporaries like Michael Bay and Stephen Sommers – is that inside the colossal exhibitions of technology and the breathlessly paced batterings of pure action, Cameron is humanist trying to make a plea for a better world. The Abyss, behind all the technology, seems like a version of The Day the Earth Stood Still (1951) located underwater – one where aliens arrive to warn us to stop the nuclear arms race. There is a stupendous fanfare of hard-technology, action and state-of-the-art special effects on display in The Abyss – massively scaled scenes of crane gantries being ripped off ships, pressurised bulkhead explosions and floodings, and an enthralling slam-bang to-the-death duel between submersibles. The mark of a James Cameron film is that humanist concerns always make themselves felt more than the awe and adrenalin – case in point being the climax of Titanic where the most tragic and heart-rending part of the film was the ending with Leonardo DiCaprio and Kate Winslet clinging to detritus in the North Atlantic far more so than the stupendously scaled scenes of the ship sinking. The core of The Abyss clearly houses heartfelt emotions upon James Cameron’s part – it is a film about love, pain and reconciliation. 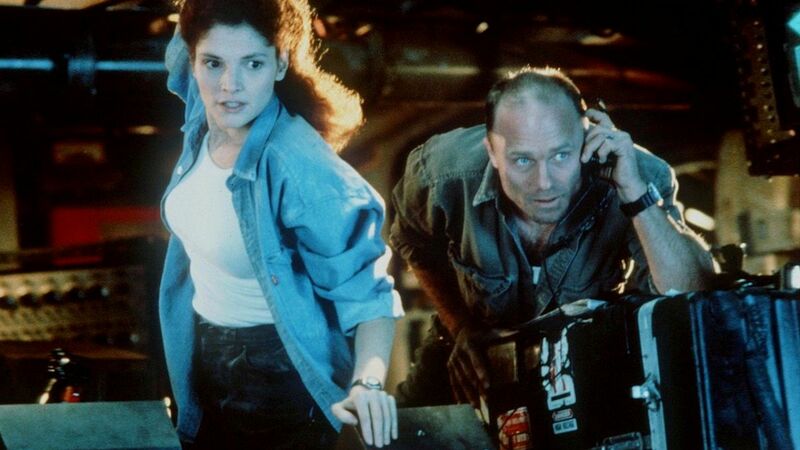 The compellingly written Ed Harris/Mary Elizabeth Mastrantonio relationship was apparently a mirror of the divorce Cameron was going through at the time with producer Gale Ann Hurd. The Abyss is an emotionally gruelling film – the scenes with Ed Harris and Mary Elizabeth Matroianni communicating as he decscends into the depths, probably to his death, are emotionally wrought. Also the scene where Harris and Mastrantonio are wrecked in a submersible with only one diving suit and she allows herself to be drowned in the hope that he can drag her back to the rig and revive her is an emotionally nerve-wracking one. For all that, The Abyss is also a film where James Cameron seems to be constantly underreaching himself and propping the film up with cliches. Michael Biehn’s fate for the entire film is set in the moment he curtly dismisses a lecture on pressure psychosis – and this becomes an issue that gets needlessly bent out of shape to make Biehn into the villain of the piece. The most disappointing aspect of The Abyss remains the aliens, which are a standard rehash of the E.T.s in Close Encounters of the Third Kind (1977) – introduced in cliche glowing lights to the accompaniment of ethereal choruses. Moreover, once they are introduced, James Cameron seems to have little idea what to do with them. In fact, one gets the feeling that Cameron’s interest lies more in the underwater technology and his characters than the aliens at all (he subsequently spent most of the 00s making a series of deep-sea diving documentaries). It is surely significant that the descent into the abyss is given more time than what happens once Ed Harris arrives there. The ending comes as a dramatically unsatisfying abruptness – Ed Harris descends into the abyss, the aliens save him. The big (anti)-climax of the film is the aliens’ ship rising to the surface, carrying the rig with it – whereupon the film abruptly stops. Certainly, in the The Abyss – The Special Edition, which was released in 1992, we have more scenes that show the aliens are holding waves all around the world suspended in a demonstration against the use of nuclear weaponry. However, the ending of the original cinematic release, which comes without that explanation, ended up being a major anticlimax. James Cameron’s other genre films as director (and usually writer) are:- Piranha II: Flying Killers (1981), The Terminator (1984), Aliens (1986), Terminator 2: Judgment Day (1991) and Avatar (2009). Cameron also wrote the screenplay for Strange Days (1995) and produced the tv series Dark Angel (2000-2), the remake of Solaris (2002), the rock diving film Sanctum (2011) and Cirque du Soleil: Worlds Away (2012), as well as hosts and produces the tv documentary series AMC Visionaries: James Cameron’s The Story of Science Fiction (2018).